People who work with friends, colleagues, or teams on projects requiring lots of documents have many ways to organize and share them, but Global Graphics Software’s GDoc Binder stands out for its use of familiar loose-leaf notebook imagery and strong annotation tools. Unfortunately, it’s not free—and this initial release does have a couple of glitches (but no real dealbreakers). GDoc Binder creates a table of contents based on a binder’s tabs, and you can see it both within the binder and as a slide-out menu in the Binder view. Created by a company with a proven track record for PDF tools, GDoc Binder essentially is a document manager on steroids, with a couple of document creation tools as well. Like some e-book readers (most notably Adobe Digital Editions), the application presents content in different hierarchical views: The library view displays all your binders on shelves (the same way magazines and newspapers appear in the iOS Newsstand), the binder view lets you leaf through a binder’s documents much the way you’d click through an e-book, and the document view lets you peruse, bookmark and annotate documents contained in a binder. Format support is excellent: The app supports everything from Microsoft Word, Excel, PowerPoint, and Visio to Adobe PDF, HTML, and popular image formats including .bmp, .gif, .jpeg and .png. The $10 cost of the application (no trial version is available) pays for 10 binders. 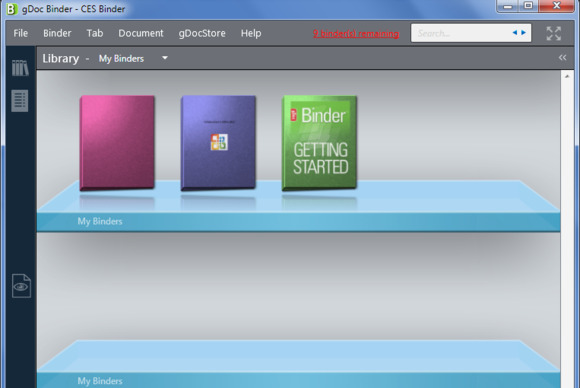 You must buy additional binders at the GDoc store (accessible from within the app). GDoc Binder by default launches in the binder view showing either an included documentation binder or your most recently viewed binder. You generate binders (which start out looking like plain notebook covers) either from templates specifying page size (e.g. A4), number of tabs, and cover color, or from Windows folders. If you opt for the latter, GDoc Binder uses the folder name as the binder file name, and turns the top level of subfolders into tabs, ignoring additional layers of subfolders and filing supported documents (Word, Excel, PowerPoint, PDF and popular image files) from all subfolders under the top-level tab. Either way, you can add new tabs to a binder from within the application, and add new documents by dragging and dropping them to the desired tab. In GDoc Binder’s document view you can add comments, bookmarks, hyperlinks and highlights (shown above) to documents in a binder—but they won’t appear on the originals. 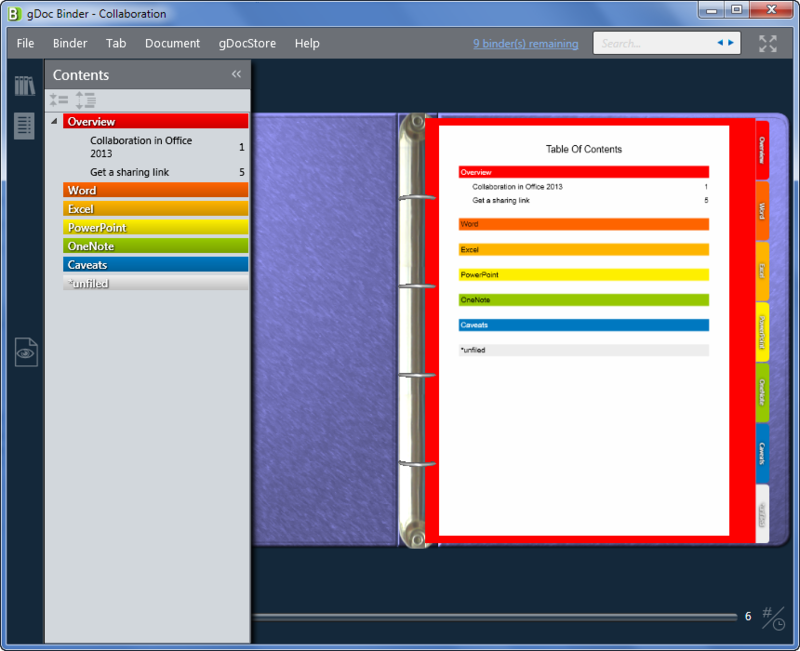 GDoc Binder automatically generates a table of contents showing tabs and documents. 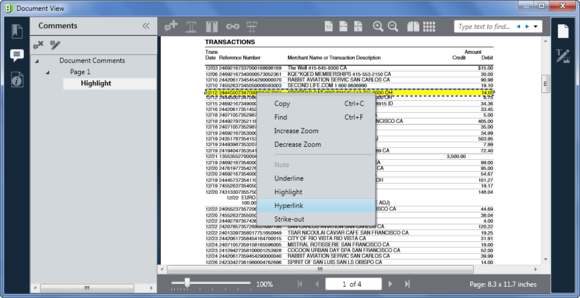 You can see it both as the first page (or pages) inside the binder, or as a slide-out menu that you summon in the navigation pane of the binder view. You can click on a tab or document to jump to it. 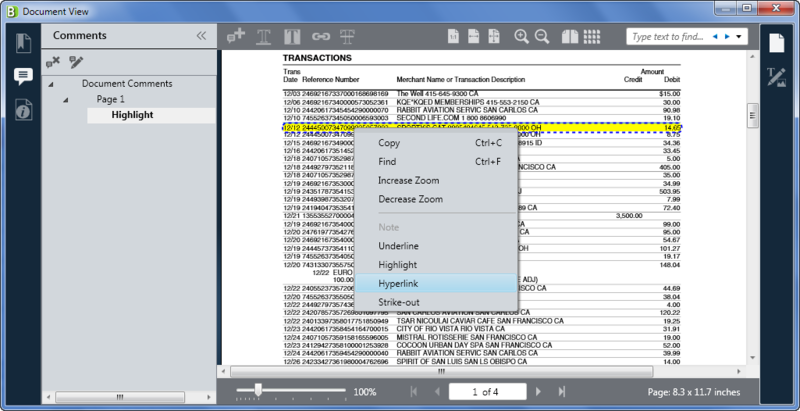 In the document view, you can zoom in and out of specific areas; add notes; highlight or underline text; create bookmarks or hyperlinks; or even draw on documents using some simple built-in image-editing tools. Because GDoc Binder creates a copy of documents you add to a binder, these annotations don’t appear in the original documents—just in the binder version. However, GDoc Binder maintains a link to the original document, and if you change the original, you can update the binder copy by clicking on Check for Document Updates in the Binder menu..
You can also create new text documents and diagrams using GDoc Binder’s built-in word processing and diagramming apps. They’re not as full-featured as their Microsoft Office counterparts, but they stack up pretty well against the Google competition. GDoc Binder’s library view shows all your binders displayed on shelves, much the way newspapers and magazines are displayed in the iOS Newsstand. To share binders from within the application, you can either distribute them via e-mail or use Dropbox. 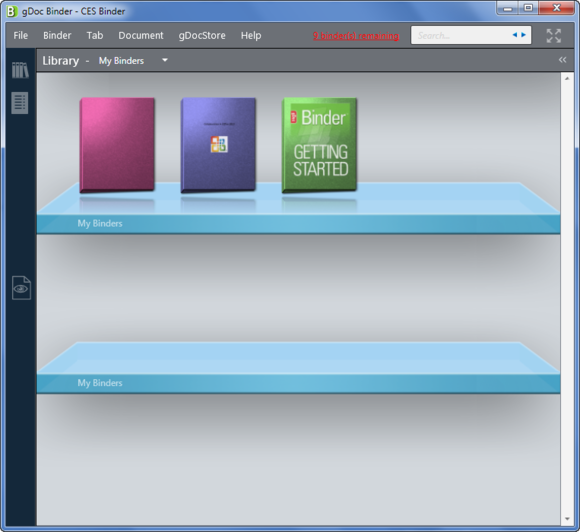 If you have Dropbox installed on your computer, GDoc Binder offers it as an alternative location for the My Binders folder where binder files are stored by default. I did run into a couple of usability issues. Dropbox setup was not clearly explained in the documentation, but more annoyingly, you cannot create cover art (or even cover text) for your binders from within the application. If you want more than a plain solid colored cover, you must create it in any of GDoc Binder’s supported file formats and then drag and drop it onto the binder. Once you’ve done that, however, you can edit it from within the app, which makes having to create it outside the app all the stranger. Of course, you can save money by using Google Docs or some other free Web-based service for document sharing and collaboration. But GDoc Binder’s pleasing appearance, familiar loose-leaf notebook metaphor, and great format support might make it worth the relatively inexpensive cost for some team projects. People who work on business projects involving lots of documents will find GDoc Binder’s attractive graphics and robust annotation features worth the modest price.